As a native Californian, the idea of a cold and snowy Christmas was quite foreign to me while growing up. I mean, I knew all those carols we sang had a basis in reality – Rudolf is totally real, folks; do not try to tell me otherwise! – somewhere, just not where I was. The idea of snow and roast chestnuts and family outings with hot beverages gripped in be-mittened hands was nothing more than a daydream. I hadn’t realised how deeply Welsh Christmas traditions influenced my definition of the holidays. That is, until Cardiff! A couple of years ago I visited Wales for the first time. Happily, Cardiff, the capital of Wales, is just a couple of hours away from London by train. In recent years, Cardiff has reinvented itself to become a destination for tourism and shopping. 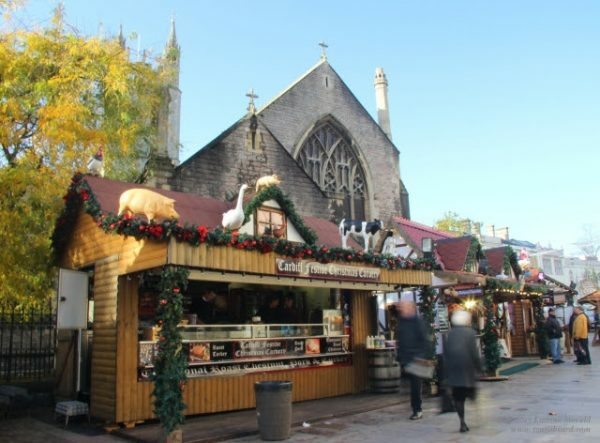 Beginning in mid-November, the centre of town transforms into a sparkling tribute to German Christmas markets while also honouring age old Welsh traditions. Just like the famous Welsh lovespoons, it’s adorbs! Welsh Christmas traditions, as in most of Europe, have evolved over the years. Nowadays, German-themed booths at the Christmas markets offer glühwein (mulled wine), wurst of various sorts, and even giant nutcrackers. In Wales, before there was mulled wine, folks used to drink from the wassail bowl. These days you’ll have to look very hard to find a wassail bowl for sale. However, woodcarving is still a favourite Welsh pastime, although with a modern twist. 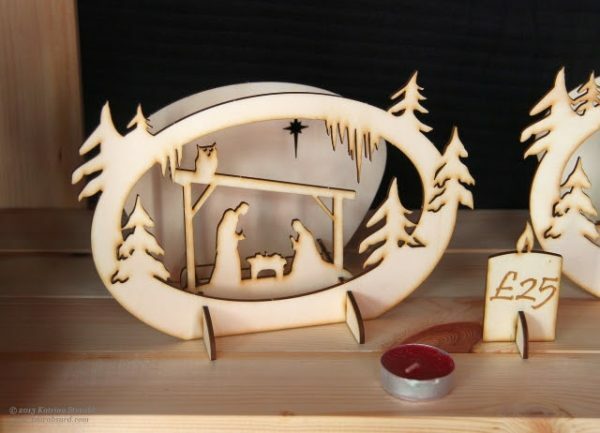 Richard Dunstone of Woodwasp makes adorable wooden cutouts and 2D dioramas using lasers for cutting and engraving. Besides holiday-themed offerings, he has a fondness for all things dog-related. Small magnets of every dog breed and type can be found at his stand. If you don’t see the one you’re looking for, just ask! Chances are he’s got it tucked away in a box beneath the counter. The Welsh Love Spoon was traditionally carved out of wood (are you sensing a theme here? ), and many still are. The family-run business of Celtic Seren makes them out of pewter. They have a large selection of jewelry and fantasy figurines to choose from, as well. Said to have originated as a courting gift, the shapes carved into the handles of each lovespoon have their own meaning, including a heart for love, a ship for a smooth passage through life, and a the dragon of Wales for protection. 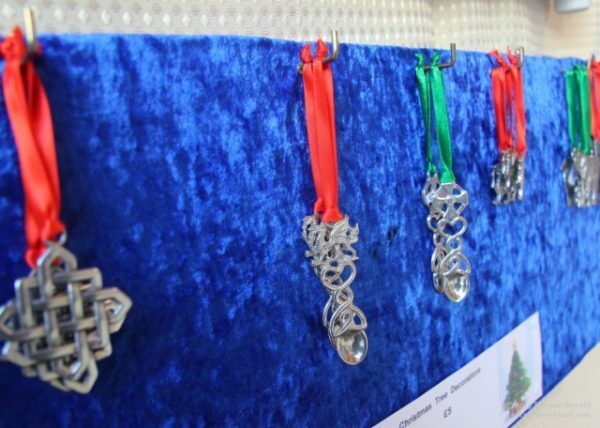 According to Gareth Giddings, the proprietor, that was the first year they’ve made miniature lovespoons designed to be Christmas tree ornaments. They are charming as well as affordable – a perfect gift! In addition to time-honored edibles – sweet taffy, hearty sausages, and mulled wine – there are a number of seasonal gifts available. More than a few vendors offering elderberry wine, liqueurs, jams, and preserves in decorative boxes vie for your attention. Other items include hand-made felt wool shoe inserts, dried fruit garlands and wreaths, candles, and even stuffed animals that can be popped into the microwave to keep you warm! Cardiff has already established itself as a centre for shopping from all around the region. The indoor malls are full of name brand clothing, electronics, and coffee franchises. 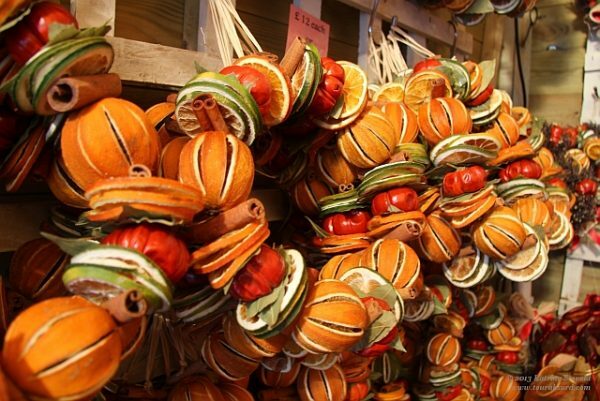 What’s great about the Christmas market is that so many local craftspeople are able to present their goods. It’s a little taste of Wales and Welsh traditions. The meandering pedestrian footpath of the Festive Quarter is adorned with twinkling lights. The weather is brisk, even nippy, and sometimes rainy – perfect for hot nibbles and drinks! Cardiff is a lovely setting for an indulgent mini-holiday. It will tickle your tastebuds and help you complete that Christmas shopping list all in one go. Yes, the German-style Christmas markets are very popular, aren’t they. Coach parties from the UK also visit the genuine article in Germany itself. Sue took a German-style chalet at the Christmas market in Mayenne, a large town and sub-prefecture for our département, a couple of years ago to sell her artwork. Sadly she didn’t sell anything in three days. Agree about Munich! I never regarded myself as having visited a country if that meant simply having landed at the airport and taken off again. That was how much of my life as a Loadmaster was! Apart from that, my standard response to anyone who asked if I had visited such-and-such a country/city is to say that I know the airport, the crew hotel and the road in between!